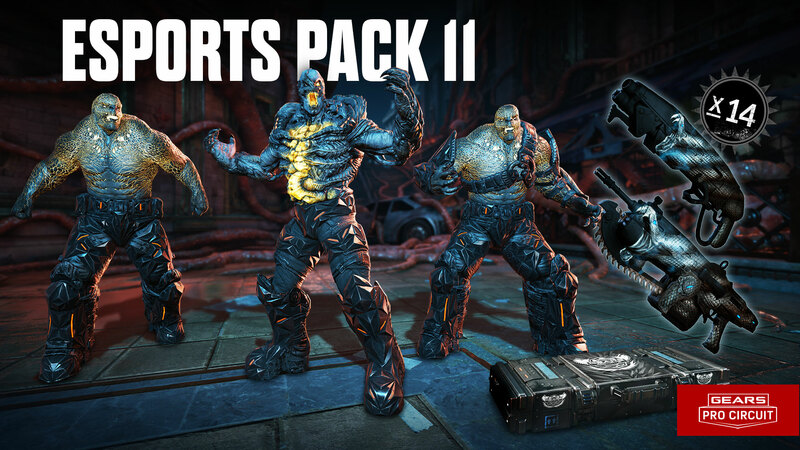 We're excited to introduce the brand new Gears Esports Supporter Pack 11! Based on the fan-feedback-inspired Mega Packs, we've made it easier to complete your Black Steel collection by lowering the number of characters per pack, and making each pack guarantee one of these characters! This is a new Supporter Pack design introduced for Season 2, and will not apply to Supporter Packs 1-5. Gears Esports Black Steel and Black Mamba items are unique to the Gears Esports Supporter Packs! To purchase this pack, visit the in-game Gears of War 4 store (Esports tab) or this website during special Gears Esports activities such as weekly Wednesday broadcasts or Gears Fight Nights LAN events. Thank you to all of our fans, players and teams, who continue to support Gears Esports and help grow the scene for Gears of War. Thank you for supporting Gears Esports! To purchase this pack, visit the in-game Gears of War 4 store (Esports tab) or this website during special Gears Esports activities such as weekly Wednesday broadcasts or Gears Fight Nights LAN events.